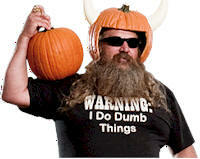 DIY - Punkin Chunkin fundraiser! volunteer gives the rope a good yank, the trigger is let loose, the arm swings, and the pumpkin soars through the air. 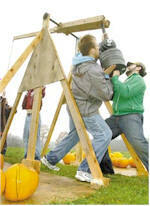 Charge $10 per pumpkin and allow part of the money raised to go to the person with the longest Punkin’ Chunkin’ toss. Make sure no people, cars or three bedroom houses are in the way of your Chunkin Contest. Yellow Springs, OH: The flying objects at Young’s Jersey Dairy were not birds or planes. They were pumpkins. Pumpkins were sent hurling through the air as part of the first Midwest Pumpkin Chuck, hosted by the Dayton Team American Chucker to raise money for scholarships for high school math and science students. More than 100 people gathered in the field just behind a batting cage and watched the Dayton Team American Chucker, Team Ethos, and honors and advanced placement science students from Miamisburg High School use launching machines to send pumpkins more than 1,200 feet into a field. The Dayton Team American Chuckers are mostly Wright Patterson Air Force Base employees who compete nationally, although this event was not a competition. They organized the event and invited Team Ethos, who are also Wright Patterson employees, to show students how fun math and science can be. This is applied science. It’s a learning process and a fun process and it gets kids outdoors and out of the classroom. The Greenland (Maine) Women’s Club came up with a unique way to raise funds for the Red Cross-Great Bay Chapter and dispose of left over pumpkins and jack-ó-lanterns at the same time. 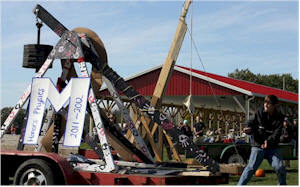 Volunteers built a medieval-style catapult, called a trebuchet. One person would pull the long, catapulting arm to the ground, while two others pushed the 215-pound weight on the other end of the arm up in the air. The arm was then secured by a rope and the pumpkin put into a large sling. Another volunteer gave the rope a good yank, the trigger let loose and the arm swung the sling – and the pumpkin – through the air. Most of the pumpkins destroyed were either left over from Halloween pumpkin sales or brought in by the bystanders. The club received a large donation from First United Methodist Church in Portsmouth, which hosts the annual Pumpkin Patch sale. This fun and creative way of disposing of jack-ó-lanterns was a community event as well as a fund-raiser. The Greenland Women’s Club collected a suggested $5 donation per pumpkin.